We’re excited to share the wonderful news that Links with Lily Golf Tournament raised approximately $9,000.00 for Lily’s Place Emergency Shelter for families. 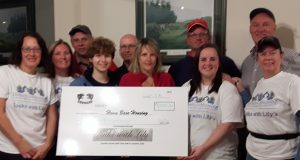 Thanks to all golfers and sponsors who contributed to the success of the tournament, to all the volunteers who made it a fun event and, in particular, to Mark Brooks and Harry Witteveen for organizing it for Lily’s Place! Way to go, everyone!